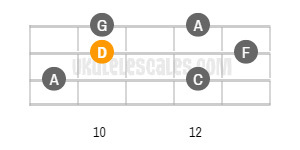 The pentatonic minor is a scale of only five notes that is often used in Blues, Pop, and Rock. 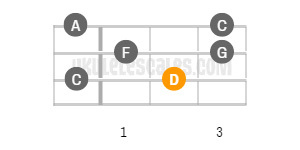 After the major scale the pentatonic minor is THE scale to know. 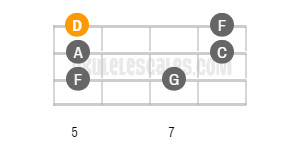 It is composed of all the same notes of the minor scale above, except without the 2nd and 6th notes. 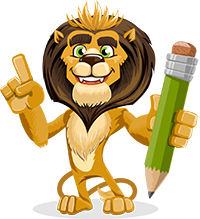 It is simply made up of C, Eb, F, G, and Bb. 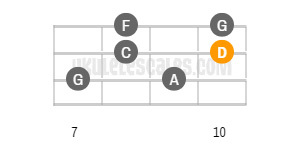 Because it is only five notes this scale can be played in a minor, major, and dominant context, it is a very versatile scale. 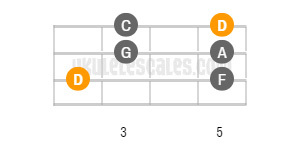 You'll find below the 5 different positions/shapes of the D Minor pentatonic Uke scale in Standard Tuning (gCEA), along with their ascending tab patterns.